It's a new day in animation! African American animators, writers, producers, voice over talents and fans are making sure that the black experience is brought to light--cartoon style. 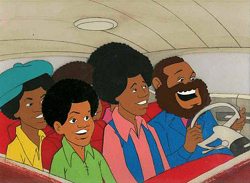 Back in the days of the Jackson 5 and Fat Albert, seeing just one black character in a cartoon was unheard of. 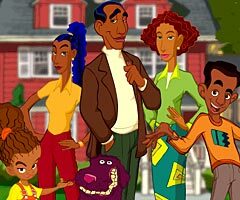 Nowadays, shows like the Proud Family, Static Shock and Little Bill are changing the game and outside of television, the web-explosion is creating its own stars. The cool thing about web animation is that we get to see creative stuff that we'd never get to see anywhere else. There's a bunch of talented and independent artists making it happen online! It's what I consider the 'new frontier.' The downside about web animation is that early on a bunch of sick and twisted dudes with too much time on their hands, and just enough animation skills, bombarded the web with raunchy, tasteless animation. But I guess that's the way the cookie crumbled. The Love brothers, Jeremy, Maurice and Robert have got mad illustration skillz. Its amazing that all of these brothers are equally as talented in the arts. From Venus Kincaid, to The Adventures of Credence Walker. You WILL 'love' the Love Brothers' stuff. They do comic books and animation. Also hailing from the Bay Area is the duo known as "Dreadfully Slick," Dread Williams and Ice Berg Slick. Their Jamurai series follows the adventures of a young dude schooled in the martial arts. The little dude is too cool with his dreadlocks flying as he rips his opponents new ones. This series reminds me of Ninjai, one of the sickest (I mean that in a good way) web series' online. The Gibbs sisters (aka Shawnee Gibbs and Shawnelle Gibbs) also keep animation in the family. 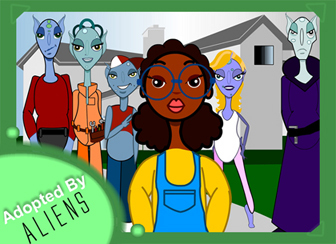 Their animated web series Adopted By Aliens has something for all ages. It has that Saturday morning cartoon feel that toonheadz like me like to eat cereal to. The twins are from my birthplace, the Bay Area--they're also a couple of cuties. Urban entertainment isn't for the kiddies. It's actually the home of some pretty raunchy animation. Although it has had some standout hits like 'Sistas 'N The City' and Undercover Brother, some of the work is a little tasteless. Just be selective about what links you choose to click on--and when. Cuz it's adult subject matter, no doubt about it. 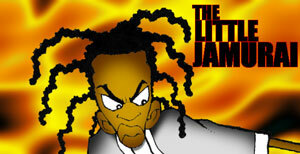 The Proud Family is one of the funniest shows on television. Just listening to the show, you recognize the voices of many talented black actors that we have come to know and love over the years. This show is well-written and enjoyable for all ages. This boy is serious about representing for his school's safety patrol. He's smart, tough and is able to make those white no-eyed glasses look cool. Plus he's got his OWN show on ABC. Now that gets major props! Hey Monie is a relatively funny show. The animation style reminds me of Dr. Katz (the comedy central show of the 90s). I'm still trying to figure out if Monie is a 'likeable' character. She's kind of humdrum and there isn't a whole lot of excitement, but what do I know about being a 'working woman?' Props to BET for trying to diversify its programming! Keep it up. Virgil Hawkins is the first black teen superhero ever! He's gifted with electromagnetic powers that allow him to save the world. This show is also well-wriiten and appeals to older kids who can identify with teen issues. This show is based on Bill Cosby's book of the same name.The one thing I can't get into is the upper-middle class issues that the show tackles. I'm a huge fan of the Cosby show, and this show feels like a rip-off of it. I'm sure they'll get new (updated) storylines. The character design is pretty cool. This one's for the little tikes. 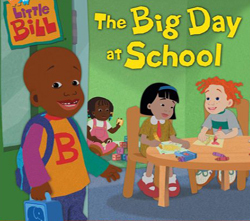 Little Bill is a great, jazzy edition to Nick Jr's diverse line-up. Along with Dora The Explora, Little Bill is helping to make pre-schoolers appreciate the differences in all of us. 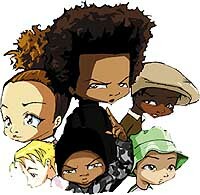 Here some of the most popular African American cartoon characters ever. I'm still trying to generate a list, I'm having a hard time representing the 1970s and 80s--maybe because there weren't many. 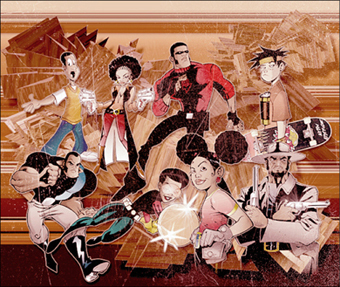 I notice that most of the black characters currently in animation are from Nickelodeon shows. They do a great job with diversity. Cartoon Network should take note. Susie Carmichael's sugary sweetness balances her nemesis, the evil Angelica. 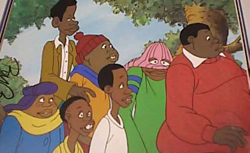 Darren from As Told By Ginger had to have been the first black male to kiss a white female character in a cartoon (he dates lead character Ginger). Don't quote me. Numbah 5 don't take no mess. She's the jive talking agent from Codename: Kid's Next Door. Storm, a mutant African goddess with the power to control the weather never received much of play on the series--or in the movie being played by Halle Berry. Pity! 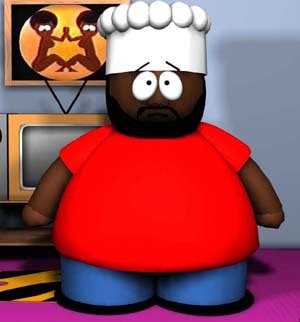 The Southpark's Chef is a genius of a character--totally out of place in the town but everybody love's him. Excellent cartoon villainess. She seems like she just needs a good man in her life. But her ex, Darren doesn't want her anymore. 3-D pal of Jimmy Neutron, who used to wear the Aaliyah 'over the eye' bang but changed the hair to braids after she was mistaken for an Egyptian Princess on one ep. Remember Kwame from Captain Planet? The series has been in syndication for years. He never had a girlfriend or a real storyline--but it was the 80's. AJ of FairlyOdd Parents is a walking brain--unlike lead character Timmy who has to wish up his brilliance. 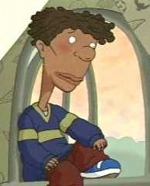 Hey Arnold's Jerold is the quintessential best friend. I can only wonder why he's still rocking the high top. 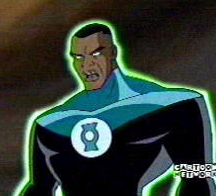 Alot of Justice League fans nearly burst an artery when John Stewart was announced as the Green Lantern for the tv series. The brother holds it down--glad they diversified the League. And Gaia, also from Captain America, always helped the kids out. Whoopi Goldberg used to do the voice.